A new web site lets people publicize incidents of motorists blocking NYC bike lanes. The developer hopes the site will draw attention to bike lane obstructions as a serious safety issue, leading Mayor de Blasio to devote more resources to improving bike infrastructure. 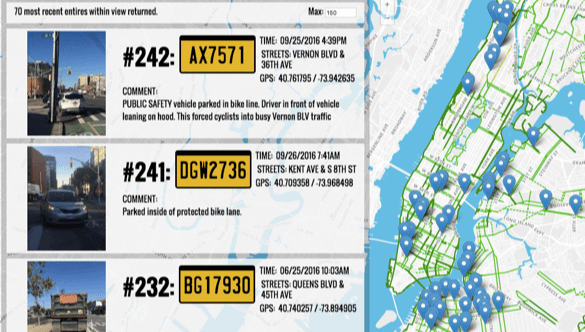 Cars in Bike Lanes allows users to upload photos of offending vehicles to an interactive map, along with time and location info, and a description of each incident. Posts are vetted before they go live. Clicking on the license plate number shows whether the motorist is a repeat violator. Developer Nathan Rosenquist told Gothamist he developed the site in response to City Hall’s “lack of leadership” on keeping bike lanes free of cars. During a recent appearance on WNYC, Mayor de Blasio said it was OK for motorists to park in bike lanes in certain cases. But parking in bike lanes is illegal, and poses a safety risk regardless of driver intent. “I don’t think he understands that it takes a lot less time to be killed on a bike than it takes to let the kids off at home,” Rosenquist said. Ultimately Rosenquist would like to collect enough data to pressure City Hall to build more protected bikeways and keep motorists out of painted lanes. “New York City’s streets and traffic management need radical permanent changes to stay sustainable,” he said. Plenty of people comment on Streetsblog despite not having spent any appreciable time in New York City, or on a bicycle. You’d be in good company. The reason for not taking both hands off the handlebars is so I can maintain control of the bike if I hit a road imperfection. Its not that I *can’t* ride with one hand, but rather that I risk losing control of the bike if something unexpected comes up like a pothole which might look innocuous until I’m almost on top of it. Note that riding at night under poor streetlighting makes such an occurrence a lot more likely than riding during the day. Not knowing what direction you’re going at an intersection has nothing to do with ineptitude. I ride primarily for exercise and enjoyment. As such, I try to stay in motion all the time. Suppose I’m hypothetically coming up on an intersection. I’m not sure whether or not I’ll make the light. Let’s further assume there is fairly heavy cross traffic. My game plan at that point is if I make the light I go straight, if I don’t I turn right on red after checking for pedestrians crossing. Note I don’t know what I’ll be doing until I actually reach the intersection. Being that I’m on a recreational ride, there is no need to stay on any particular route. I might do something similar at a stop sign. If there’s so much traffic I’ll need to wait a while to go straight then I turn right. Right turns on a bike generally don’t conflict with motor traffic so long as you keep to the right of the traffic lane. In fact, that’s the entire premise behind “protected” intersections in places like the Netherlands. You can always go right no matter what color the light is. It’s frankly hard to tell where you ride given that almost nobody in NYC regularly does most of the things you mentioned. As I said earlier, I have yet to see a cyclist in NYC using hand signals to indicate turns. In NYS there’s an estimated average of not much less than one million vehicle miles traveled between injury or fatal crashes. Include property damage > $1000 and it’s still more than 300k vehicle miles traveled between crashes. Smaller fender benders are excluded, but you’re excluding the crashes where you hit a pothole and bust up your wheel, right? In general people are bad at judging the difference between a once every couple decades risk and a once in a hundred lifetimes risk. If I were you I wouldn’t read too much into your current good safety record. I think that those of us who use signals are incredibly overrepresented here at streets blog. I do use them, although not all the time, but I can’t remember ever seeing someone using them while I was riding unless it was a coworker from one of the bike orgs. That said, it really does make you safer in most situations to use a hand signal. Clearly there are streets that you won’t do it on because they’re full of pot holes and other road hazards, Ditmas is one where I never take my hands off the bars, but most of the time it really is helpful, and cars will notice and understand. I think that sometimes they let you in because they’re so in shock from seeing a cyclist signal that they don’t think to do otherwise. If you look at the crashes per hour of exposure, rather than miles traveled, things look way better than you described. To the best of knowledge nobody has thoroughly studied the subject of bike crashes other than the very rare ones where people are killed or seriously injured. All we really have to go on are people’s anecdotes. I never bothered tabulating my falls due to potholes or doors but I can safely say I could probably count them on both hands. I probably have about twice that many incidents where I didn’t fall but incurred damage like dented rims or cracked frames. The falls occurred during my first decade of riding while I was still arguably gaining experience. The exuberance of youth didn’t help. I did some things back then that make me cringe thinking about them now. That said, other than the few dooring incidents, everything else was cause more by the poor condition of NYC streets than by the way I rode. Had I ridden exactly the same way in the Netherlands, where street maintenance is taken seriously, 95% of those incidents wouldn’t have occurred. Comparing my crash record to others I’ve known, while admittedly still anecdotal, gives greater insight. Most of the cyclists I’ve known have crashed far more frequently than me even when you consider the time I was a novice rider. To be sure blind luck is sometimes involved. I tend to think however when you have “good luck” stretching over more than two decades maybe riding skills play a part. Supporting that theory is the fact my crash rate dramatically dropped by my mid-20s. I had a few incidents after that but nothing since 1996, and nothing which required medical treatment ever. Where and how much I rode didn’t change dramatically during that time. My crash rate hit zero even when I was still doing a good amount of riding during the day, even during rush hour. Why do you think night owls or people who are overly sensitive to MV emissions are so poorly accommodated? With that and similar stuff my first theory would be that people usually expect everyone else is like them, and the people ‘in charge’ aren’t that sort of night owl. Interestingly, night owls aren’t as small a percentage of the population as you may think. I was actually surprised myself how prevalent they are. The fact the majority are on early schedules may reflect simply force of habit. For a long time we were an agrarian society with poor sources of artificial light. This dictated that we rise early to make the most of daylight, even if our body clocks told us otherwise. My working theory is “night people” played a vital role while we were still hunter/gatherers. They hunted at night, and also guarded the settlements. Agriculture largely negated the need for those two things but the night owl genes remained. Now we have the luxury of choosing any schedule we want but so far it seems we’ve stuck to early schedules as a hold over. MV emissions may not negatively effect most people as severely as they effect me, but they’re problematic due to the health problems they cause. That alone should move us towards reducing them (along with the emissions from other sources, like buildings). In much the same way, I think some people may need to make more trips than you. I don’t doubt that. As someone with no children who works at home and doesn’t care much about traveling I’m probably an outlier. However, reducing the length of necessary trips by putting things closer together is something which could work for everyone. Not everyone can work at home, but there’s no reason we can’t have more jobs a few miles or less from where people live. Changing land use patterns as you said is a great way to do it. If NYC let private homes run some types of businesses that alone could dramatically reduce the length of many trips (and provide jobs as well). I do tend to sometimes make gestures when a motorist seems confused about my intentions. Usually it’s waving them though at a four-way stop sign. In lieu of turn signals, I’ve noted turning your head when you’re thinking of merging with traffic seems to work well in getting driver’s attention. It’s a subtle gesture which tells them by looking in their direction you intend to go there. It’s also a great idea for safety reasons. So yes, I do see some value in using signals of some sort in ambiguous situations. I do use them, although not all the time, but I can’t remember ever seeing someone using them while I was riding unless it was a coworker from one of the bike orgs. Thanks for letting me know I wasn’t just imagining things. We have no less than four cyclists in this thread who use turn signals and yet both of us never remember seeing anyone using them. I think “incredibly overrepresented” might be an understatement! To be honest, I almost never see other cyclists even using the kinds of signals I do. Also one skater here who signals. I didn’t do it consistently, but I have found that sticking out an arm to claim half a lane when I’m passing a double-parker, or using a shoo-shoo hand-wave to tell a driver he can go first, really helps. I probably could signal my turns a little more often.